Visit the website to look at teasers, blogs, and people they have interviewed, and to contribute to their cause generously at We Fund.Your help is very much needed in their successful completion of the film. Please, chip in! Even Rahul Dravid supports “Death of a Gentleman” ! 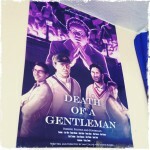 This entry was posted in Couch Talk, Test Match Cricket and tagged Couch Talk, Cricket Documentary, Death of a Gentleman, Jarrod Kimber, Podcast, Sampson Coliins, Test Match Cricket. Bookmark the permalink. Subhash, you are doing a great job with the podcast. You are interviewing some of the ‘happening’ people in the cricket world. I have just one crib – sometimes, it appears like you are trying to sound like a foreigner when you talk to them. my humble opinion is that you should speak it the way Indians normally do…with the hard ‘R’. Thank you Arv. I’ve lived here in US for 14 years now and there is bound to be some change to my accent, you would expect. Wouldn’t you?